This historic is being offered for sale by Bonhams Auction house at the Goodwood Festival of Speed 2019 Auction. The auction will take place on the 5th of July 2019. This historic, sophisticated and complex Formula 1 car contested 13 of that year’s 16 qualifying Grand Prix races, and was driven by World Champion Nigel Mansell in seven of them. The combination of Nigel Mansell and this Williams-Renault FW14B chassis ’08’ won five of those seven Grand Prix races and finished 2nd in another before the car was entrusted to Mansell’s Italian team-mate, Riccardo Patrese. 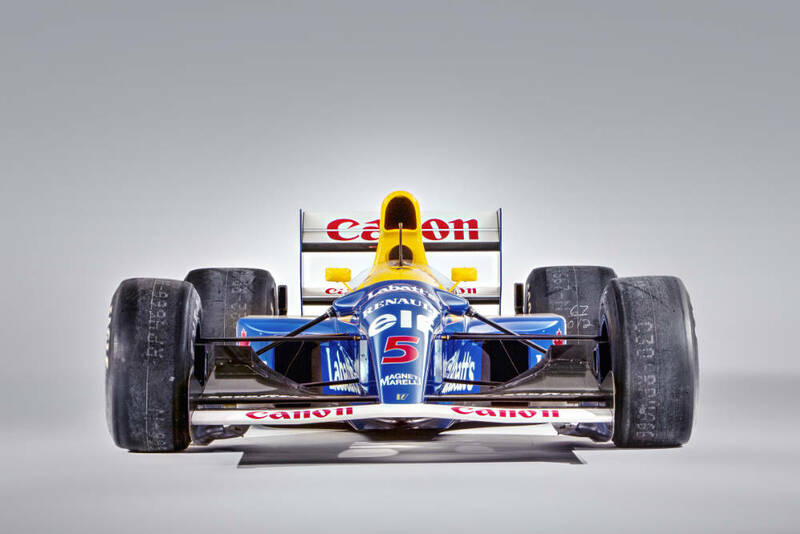 The FW14 made its debut at the 1991 United States Grand Prix. The car was clearly the most technically advanced on the grid but teething troubles during the season stymied the team’s early progress. Nigel Mansell and Riccardo Patrese recorded 7 victories between them but the Drivers’ Championship was wrapped up by Ayrton Senna in the McLaren MP4/6, which had better reliability. Williams had the faster car throughout the balance of the season and it provided a run of good form in the mid season for both Mansell and Patrese. Mansell, in particular, had several retirements due to the then new-for-Williams semi-automatic transmission, with most of these retirements occurring while in a position to win races. Patrese was impressive on several occasions and retired while leading twice. McLaren’s superior reliability told in the Constructors’ Championship as well, as they narrowly took the title from Williams. The result was that there were many races in the 1992 season where Mansell and Patrese would gain 2 seconds on the rest of the field, especially in the early laps, which made the FW14B far superior to even the next best car, the McLaren MP4/7A. Another example of Williams’s dominance that year was at qualifying at the British Grand Prix at Silverstone, where Mansell’s pole position-winning lap was a whole 2 seconds faster than Patrese, who in turn was a second faster than 3rd placed Ayrton Senna. Williams were clear winners of the 1992 Constructors’ Championship, but the season ended in acrimony as Mansell left the team after Alain Prost was signed, while Patrese moved to Benetton for his swansong season in 1993.